The wily Colm Cooper once again broke Limerick hearts with a scoring burst of 2-5 at the Gaelic Grounds as the All-Ireland champions marched on to a provincial final showdown with Cork. However, while he endeared himself to Kerry fans, Cooper was boohed each time he touched the ball after he had been involved in a 55th minute incident with substitute Mark O’Riordan, which led to the Limerick player’s dismissal. It looked as if the Kingdom were about to justify the massive vote of confidence given to them to overcome this hurdle when Cooper made a clean catch from a long ball from Dara Ó Sé to beat keeper Seamus O’Donnell inside 35 seconds of the start. O’Donnell, in fact, proved Limerick’s saviour in a frantic opening 10 minutes, making heroic saves from Mike Frank Russell and Eoin Brosnan. Amazingly, Kerry were not to score again until a few minutes before the break when that man Cooper was on target from a free. Sandwiched in between five pointed frees from Limerick captain Muiris Gavin, and with Conor Fitzgerald and Conor Mullane also finding their range, the holders found themselves three behind, 0-7 to 1-1. 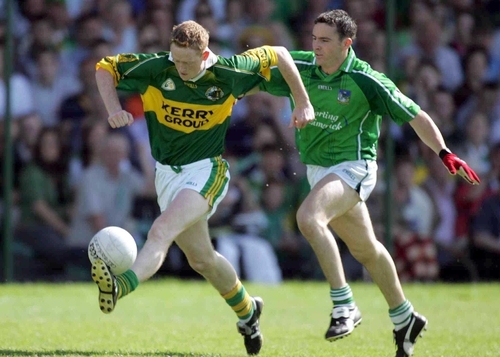 The situation worsened for Kerry immediately on the changeover when Stephen Lavin tacked on another point. Liam Hassett narrowed the gap, but the magnificent Cooper, with the wind behind him, replied with four on the trot, to put them in the driving seat 1-6 to 0-8. But Limerick kept the game alive when Gavin pointed from another free. Cooper showed a touch of class with a delicate chip over Michael O’Donnell, who, distracted by Hassett, allowed the ball to roll past him and into the net. Reduced to 14 players, and a goal behind, the pressure was now very much on the home side and they managed just one more point to the finish. Kerry had by now introduced substitutes Dara Ó Cinnéide, Séamus Moynihan and Bryan Sheehan, all three getting their names on the scoresheet, and Eamonn Fitzmaurice also got into the act. Kerry manager Jack O’Connor said that improvement would be needed if they were to hold on to their Munster title, while Limerick county board chairman Denis Holmes felt that the sending off of O’Riordan gave the initiative to Kerry. Scorers - Kerry: C Cooper 2-5 (0-4f), E Fitzmaurice, L Hassett, D O Cinneide, S Moynihan, B Sheehan 0-1 each. Limerick: M Gavin 0-7 all frees, S Lavin, C Mullane, C Fitzgerald 0-1 each.